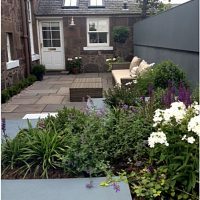 We turned this awkward, overlooked garden in Stonehaven into a secluded secret suntrap garden, where the owners are at last able to relax in comfort and privacy. Before: a drab garden with blockwork walls and rusty steel brackets for the fence topper. 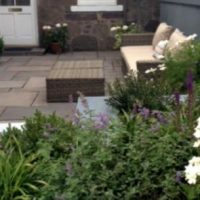 The house itself was lovely sandstone and beautifully decorated inside but the client could not get inspired about her garden. 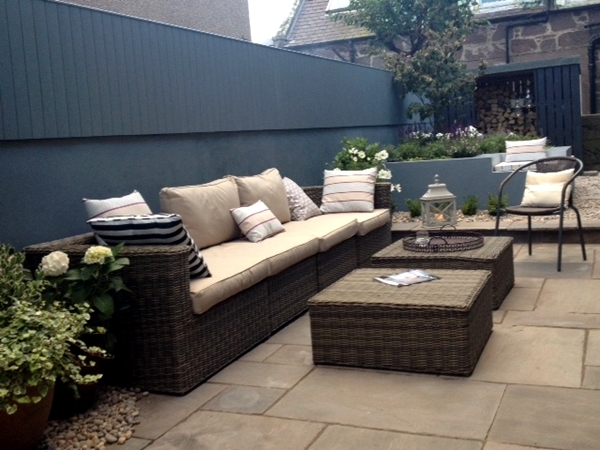 All that the client saw was the ugly walling and the neighbours' house windows when in her garden. The client did not realise that we could render the blockwork smooth – to look more like an inside, plastered wall – and cover the fencing with tongue and groove larch boards. And then it could be painted whatever colour she wanted – more like an inside space, but outside. 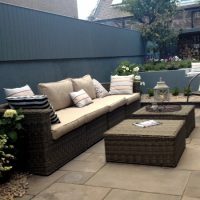 We also decided to build some height into the garden with a built in planter with seating and remove some of the side borders so the garden did not feel unusually skinny and long. The resulting effect was lovely and the client was very pleased! She now feels as though the garden is much larger and also feels much more like the inside of her house!